This trio features three shows with female leads, and while I’m only giving one of them a Gold Nugget Alert, all three were good enough to convince me to come back for more. After several (several!) seasons of high-quality shows packed with male characters, could this be the season when well-written female protagonists make a comeback? In the name of the moon, I sure hope so. Hit the jump for the full meet ‘n’ greet. 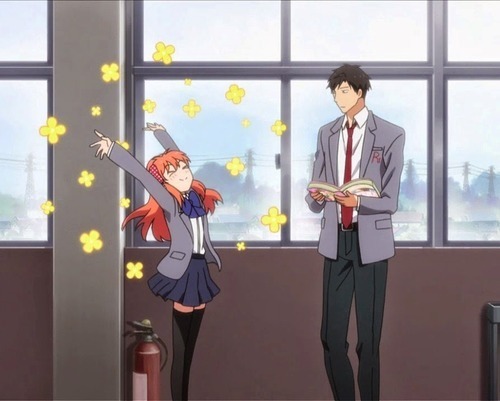 In a Sentence: After a botched love confession, Sakura Chiyo ends up working as an assistant to her crush, Nozaki Umetarou, who just happens to be a popular shoujo mangaka (comic artist). How was it? Ouran-esque. And yes, that IS the highest compliment I can pay a comedy. While Aldnoah.Zero is probably the objectively best premiere I’ve watched thus far, MGN is by FAR my favorite. I called it Ouran-esque and I really think that’s the best description of it, as it’s utterly delightful from start to finish, with pitch-perfect humor and characters quirky and endearing and just different enough to give a nod to the stock tropes without actually becoming them. And, much like Ouran, the story is both parody and celebration, poking fun at the shoujo tropes with a nod and a wink. (And yes, I know this isn’t technically categorized as “shoujo,” but if it walks like a duck and quacks like a duck, I’m probably going to feed it bread crumbs.) Walking the line between loving your genre and laughing at it is a tough balancing act, but when it’s done well it produces some of the most enjoyable series in fiction. 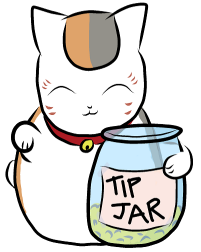 Here’s hoping MGN can keep the charm flowing in the coming weeks. Wild fangirls couldn’t keep me away. In a Sentence: Shy girl Sekiya Naru is dragged into the world of yosakoi dancing after she meets the exchange student Hana Fountainstead at a local shrine. This show had a lot of strikes against it going in – usually series with all-girl casts coming out of seinen (young men’s) magazines tend to be bland and cliche, geared more towards moe and fanservice than actual stories. 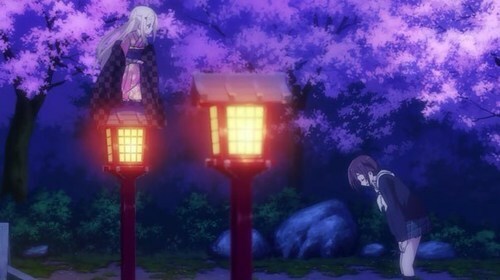 And while some of those trends are definitely present in Hanayamata (I’m not capitalizing every other letter, dammit), this premiere was handled with enough charm and wit that I didn’t FEEL like I’d seen these characters before, even though I almost certainly had. Execution really is everything. More to the point, this show is freaking gorgeous. When Madhouse is firing on all cylinders, nobody can match them in terms of ethereal, otherworldly beauty (P.A. Works is right there with them, although their art produces a slightly different tone, IMO), and boy, they did not hold back on this one. The scenes at the shrine were magnificent – I actually gasped at one point – and created a magical, fairy tale aura that was utterly captivating. 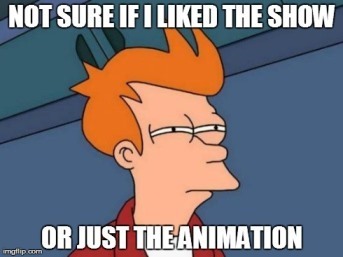 The second half of the episode didn’t have the same sense of wonder to it, but it didn’t drive me away, either. If this series can focus on its fairy tale aspects and the art of yosakoi dancing (not your average school club, that), it may very well prove to be more than just another “cute girls being cute” series. There’s a chance I was bewitched by the artwork and this one will lose its charm in a hurry (Madhouse has done that to me from time to time), but I’m going to give it at least one more episode to see if the magic was a fluke or a trend. Fingers crossed that this fairy tale has a few more chapters to it. How was it? Pure shoujo. I feel a little bad for AoHaru, because I watched it right after Monthly Girls’ Nozaki-kun, meaning that my brain was still in parody mode. And where MGN is self-aware and silly, AoHaru is 100% sincere, a shoujo school story through and through. You really have to check your snark at the door with this one. If you can, though, it’s a lovely little premiere, if not exactly ground-breaking. The main pair seem to be well-written, with a lot of hidden layers and the potential for further development, and the OP/ED themes suggest there will be both new male and female additions to the main cast before long. I get the sense that the series could build on itself very well as it explores its central themes – change, identity, and the crossroads between the past and the future. These are well-trod roads for high school coming-of-age stories, but they also have the potential to produce some truly memorable characters and tales. This wasn’t the most riveting premiere, but it was solidly watchable, and I’m optimistic that the series will build on itself. 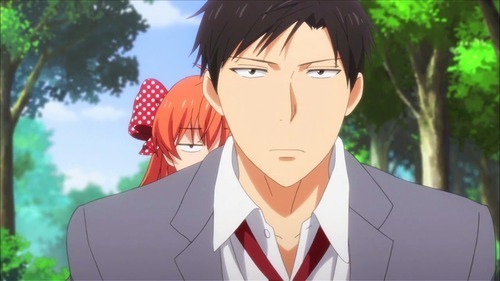 I’m not the biggest fan of realistic high school stories (I like my shoujo with a slight fantastical twist), but this one gets at least another couple episodes to see if it can get me to fall for the characters. If so, I’ll be putty in its hands.